What is it about sim games that captivate people? How can something that seems so mundane (like doing chores and baling hay) grab our attention and pull us in for hours on end? Let’s be realistic, most of us wouldn’t do these things in our real lives unless there were no other options. I’m typically not a sim gamer. Sure, I’ve had fun with games like Animal Crossing and Harvest Moon, but they bring a specific art style and play mechanic to the table. They’re cute, silly, and very care free. I’m normally the guy who is into fast-paced First-Person Shooters, or story-heavy RPG’s. I’d rather shoot first, ask later, then shoot again in Ghost Recon: Wildlands, or venture deep into irradiated wastelands mini-nuking super mutants in Fallout 4. That weekend, we ended up at my parents’ house for a family get-together. You know the type, lots of food, all the siblings and our respective children, and for our family, nerding out to games. While I was there, my little brother introduced me to his newest obsession: Farming Simulator 2017. I shook my head and laughed a bit, yet there I was, staring at a screen full of highly detailed terrain and looking at one of the most amazingly rendered sunsets I’ve ever seen in a game. It was stunning to see! I sat there with him as he plowed fields, planted seed, and harvested crops. He had a full-blown forestry division, a herd of cattle, and fields of various produce ranging from wheat and barley to potatoes and sugar beets. And don’t even get me started on the pigs! I love pigs! Pigs bring bacon! No bullets were flying, no secrets were being unlocked. He was simply doing chore…and loving it! My brother pestered me for a few months to get the game. I avoided it for quite a while until it popped up on an Xbox Live Gold deal with all the downloadable content included. I had just purchased South Park: The Fractured But Whole and was positive that would be my go-to game for quite a while. Well, a combination of South Park being the most non-kid-friendly game I’ve ever seen and the super-cheap sale on FS17 changed that. I don’t get much game time where my little ones aren’t around me in some form, so I gave FS17 a go. What I was greeted with was a spectacular experience. I was plopped straight onto my own farm, with some basic equipment and a few small fields. It was quiet, no music, the sound of a slight breeze and feeling of an early morning in a rural area. You could almost smell the cool, crisp morning air! The tutorial was minimal, and it felt more like a few friendly hints as I set off on my cultivating experience. The more I played, the more it sucked me in. I’ve always been a fan of farm machinery and heavy equipment. In my daily life, I drive a tractor-trailer. Think of me as a glorified UPS guy with a much bigger truck. Yet, here I was with crops to tend and all these large machines at my control. And you know what? It’s incredibly relaxing. I’m not hurried to find points of interest, I’m not getting shot at, and I’m not being pressured by a time crunch. I can sit back, tend to some chores, and explore. 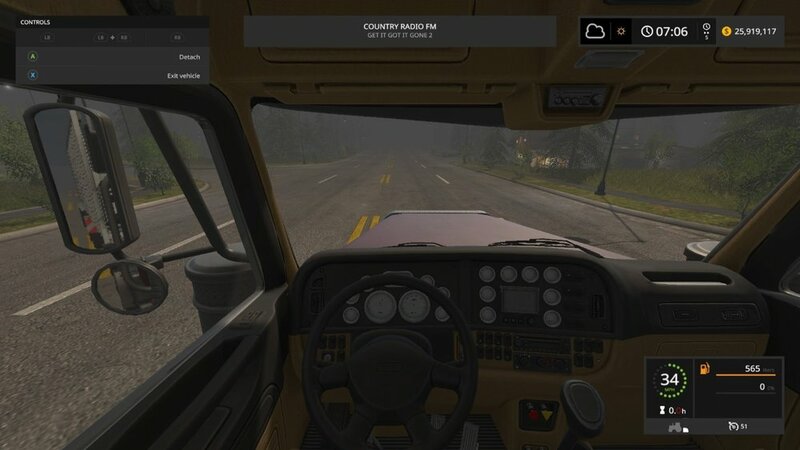 Now, this game isn’t going to win any awards for being the most advanced driving sim ever. The controls can be a bit clunky with the Xbox One controller, and the physics can lead to some interesting glitches at times. But the first time you see your harvester on a fog covered field, tearing through some soy beans or wheat, you forget all about the little things. And that’s what this game is about. It’s about forgetting the world outside and simply existing in a quiet backwoods town. It’s about the smell of the country air, cow dung included. It’s about the simple life. Oh, and BIG ARSE TRACTORS! Now, if you’ll excuse me, I have some sheep that need my attention and some grain to get to the mill.